First, you should take care of the brows, if they are too pale. I bet that they need coloring, because the smoky makeup will make them pale anyway. So, a flat brush, a brow pencil and clean mascara wand will be your tools for coloring the brows. Oh, I almost forgot, you will need a highlighter too. After the brows are colored and ready, you can move to the next step – primer on the lids. The lid primer is also an essential part of the makeup, because it is the glue between the shadows and the skin. You know that the eyelids can produce oils and these oils can create smudges when the eyeshadows are on them. The primer absorbs these oils and prepares the lids for the makeup. That’s why it is so important for the good makeup – it makes it last longer. Apply some of the pencil on the lid. Then smudge with finger and blend with brush for more precise look. Reapply and blend until you get bold color on the lid. Then use a smaller brush to enhance the bottom lash line. Draw a line right into the top lash line in order to remove this empty space. If your eyes are small, don’t trace the bottom waterline with the black pencil, but if they are large enough, you can cover the waterline for a more intense look. Finish the makeup with a coat of mascara. 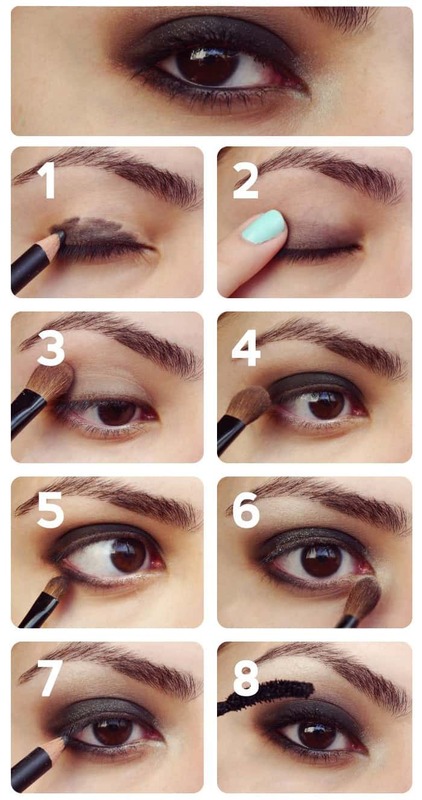 If you want to make the eye look bigger, you can highlight the inner corner of it.